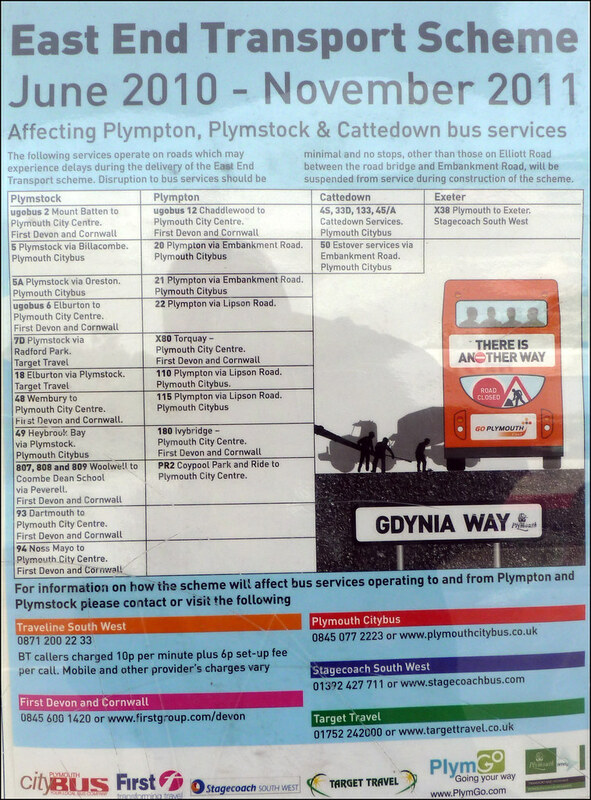 Plymothian Transit: Disruption will be minimal? I must admit I am not quite so sure that this will be the case. If you look at the bottom of this post you will see the twitter Facebook feeds for Citybus and First and see the problems they having yesterday, and this was just down to the preparations for the main road works that start next week! At the moment traffic from Plympton / A38 comes off Embankment Road (4) and then goes into Gdynia Way (5) and heads into the city which takes it underneath the Heles Terrace junction (1). 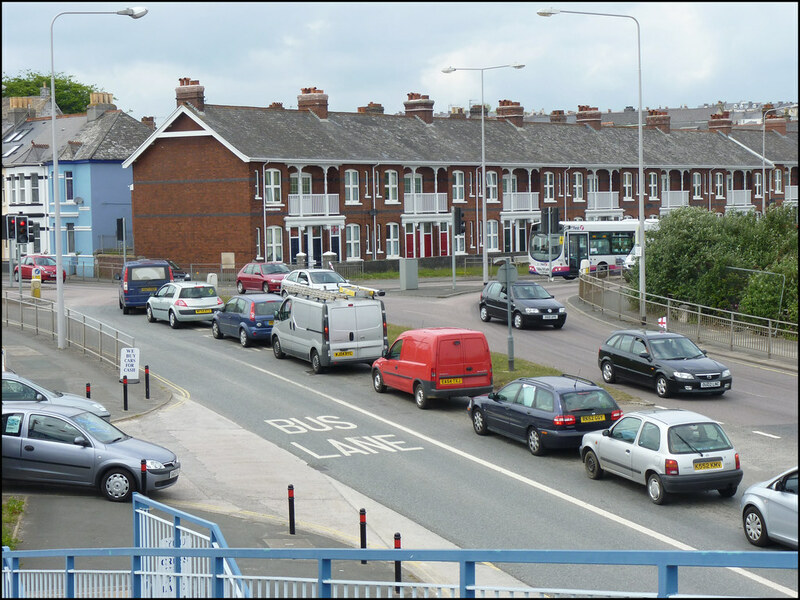 When Gdynia Way is closed there will be two lanes from Embankment Road (4) with one lane for Plymstock traffic turning left into Heles Terrace (2) and one lane heading straight up Embankment Road where it will then switch back to the other carriage way (6). This section is currently one way taking traffic out of the City. 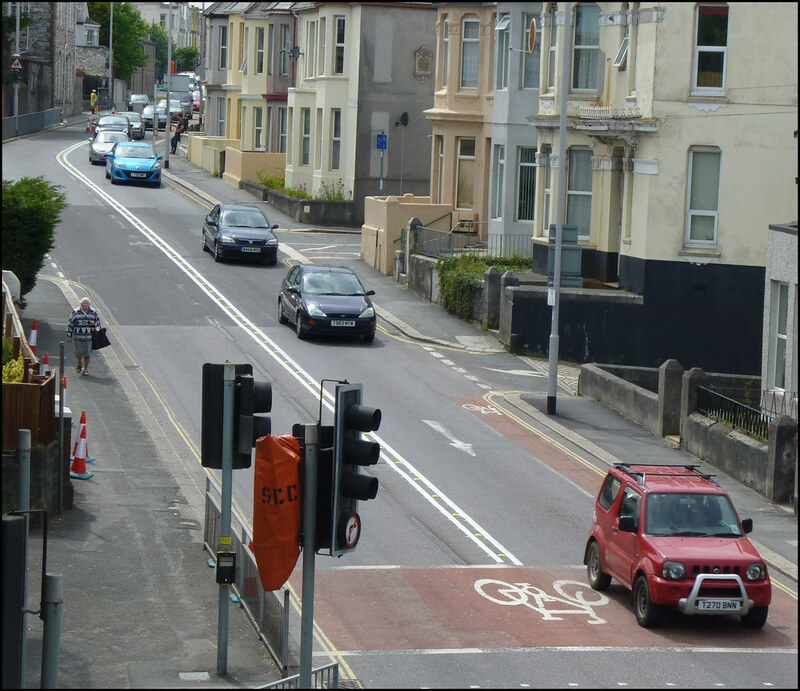 You can see below that the white lines have already been added to Embankment Road for two way working. Now in theory this should not be too much of a problem as traffic is already pretty much single lane to Plymstock and single lane into Gdynia Way and indeed single lane down Embankment Road heading out of the City. The Plymstock bound traffic from the City Centre should be diverted away from the area so this should help a bit as well. 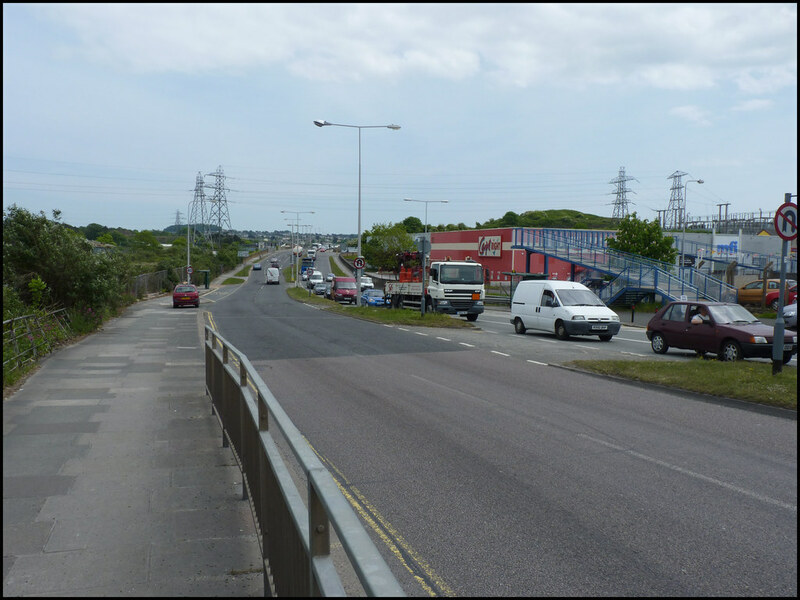 This is the view looking towards Plymstock yesterday (taken at point 7 on the map) you can see the queue of traffic goes way down the road and onto Laira Bridge itself. Traffic coming out of the City will also have to wait for this traffic, as it already does, but will have the additional problem of buses stopping. At the moment traffic can get passed the buses at this stop, but this wont be possible when the road is two way. 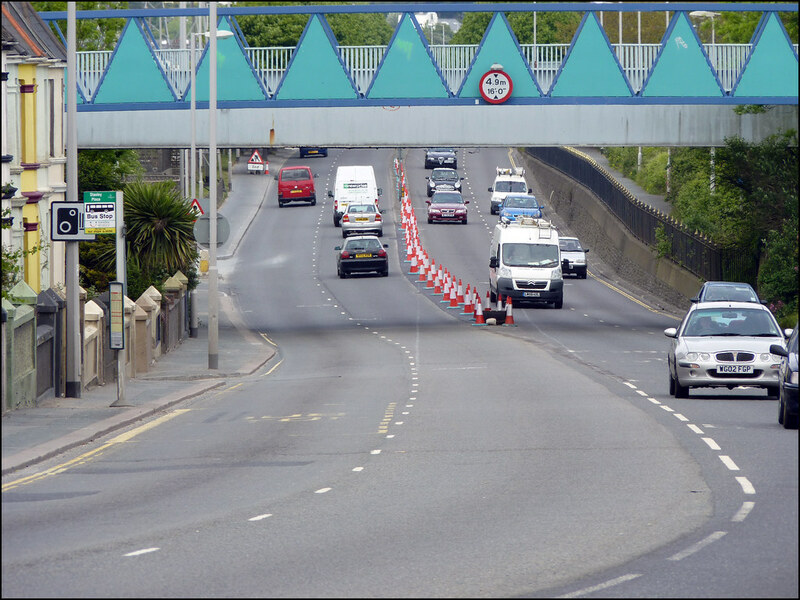 There is a further stop on Embankment Road (just up from point 4) which will also halt traffic behind it, which will affect all traffic from the City and Plymstock. You can see the new layout has been marked out on the road surface the bus stop being the point where outward bound traffic starts to split into two lanes but the current outbound lane will soon be the main inward lane. The poster does seem to suggest that these stops will remain in use. As I said at the start of this long rambling post both bus companies were affected yesterday. I caught a Citybus 50 from Asda and there were 4 50's passing through the complex at the same time, 2 following each other towards Derriford and the one I was on was caught up at the traffic lights by the next one heading towards town. 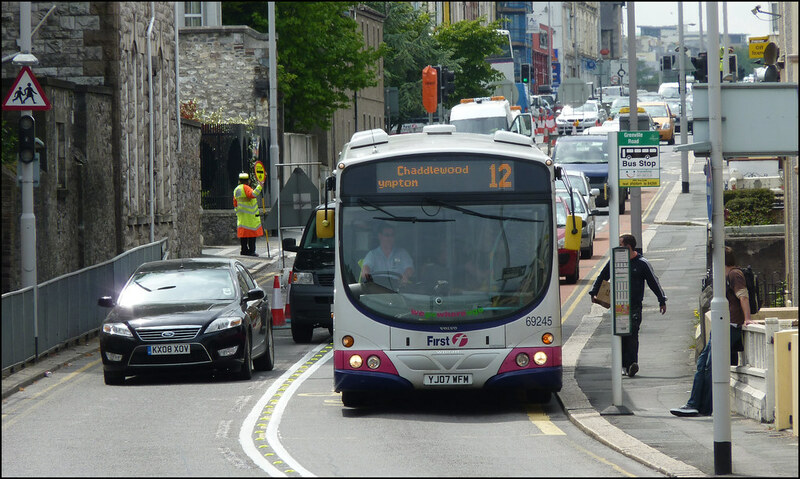 I saw several examples of this with First service 2 also seeing bunching at Laira Bridge. When the main works start and Gdynia Way closes its all going to be very fraught and cause major jams. 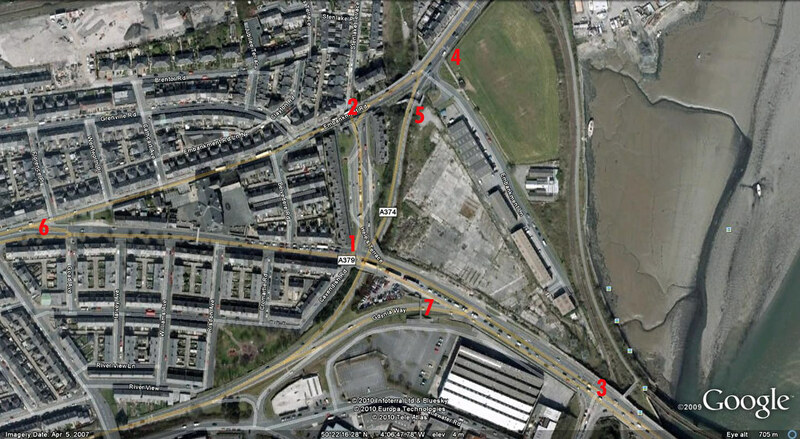 Hopefully once locals get used to it and find other ways around the area it might settle down a bit but I do wonder if it would help matters if the traffic coming out of Heles Terrace (2) could be diverted through Cattedown (1) up to Cattedown Roundabout and then down Embankment Road. Citybus Solo on the road! : The shot we have all been waiting for! 13;13 FIRST PLYMOUTH: currently delays to services X80/180, PR2, 2, 6, 12, 48, 93 heading into City due to roadwork's in Prince Rock area. 14:34 FIRST Little reminder that we're operating a Sunday service on Monday except for Serv 300 which will operate as normal. Have a great bank holiday! 16:22 FIRST Traffic caused by roadwork's at Prince Rock seems to have cleared now. Thanks for your patience during delays. 16:42 FIRST Delays to George/Milehouse PR1 & Tavy Linx due to road traffic accident on Outland Road.